Just an hour and a half north of The Preserve on the San Francisco Peninsula, a 400-acre conservation community is nestled in the hills of Portola Valley. Portola Valley Ranch is an active, landowner-led planned community committed to protecting its shared natural resources. Like The Preserve, homes recede into the landscape and residents adhere to community guidelines to protect the land. The members are proactive about pulling weeds and only native landscaping is permitted. Communal resources, including a vineyard and community garden, are managed by the residents. The Conservancy team visited Portola Valley Ranch on January 8, commencing a partnership founded on shared values and common challenges. Our meeting focused around robust conversation about fire safety, emergency preparation in disturbance prone landscapes, and grassland restoration and delved into sharing practices for protecting and restoring natural resources. 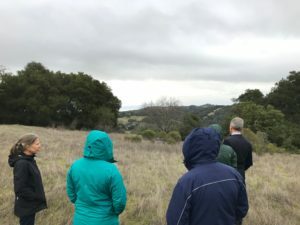 Between periods of rainfall, our group took a hike around the Ranch to observe Portola Valley grasslands, and dreams of seasonal cattle grazing percolated among our hosts, as Conservancy staff conveyed the advantages of carefully managed grazing over mowing. Portola Valley Ranch is a beautiful woodland landscape with majestic oaks and sweeping vistas. A few steps into the trail reveals challenges, including the devastating impact of Sudden Oak Death (SOD) and new emerging pathogens. Further up the trail, we find ourselves in a grassland quickly becoming dense with coyote brush. The conversation shifts from tree injections and bay removal to conservation grazing and prescribed fire. We have much to share with one other. Communities big and small are experimenting with strategies to protect natural resources and maintain a healthy landscape. From Sudden Oak Death to community engagement, there are many learning opportunities just outside our doorstep. With an increasing number of ranches and residential communities taking control of managing the land to co-exist harmoniously with wild neighbors in rugged landscapes, the Conservancy and The Preserve have a lot to offer and plenty to learn. It is exciting to make friends with a like-minded community and find ways to inspire and provide leadership in progressing conservation practices with our neighbors, near and far. The Conservancy looks forward to hosting staff and residents from Portola Valley Ranch at The Preserve soon to continue our conversation and learning exchange in the near future.